Homepage. 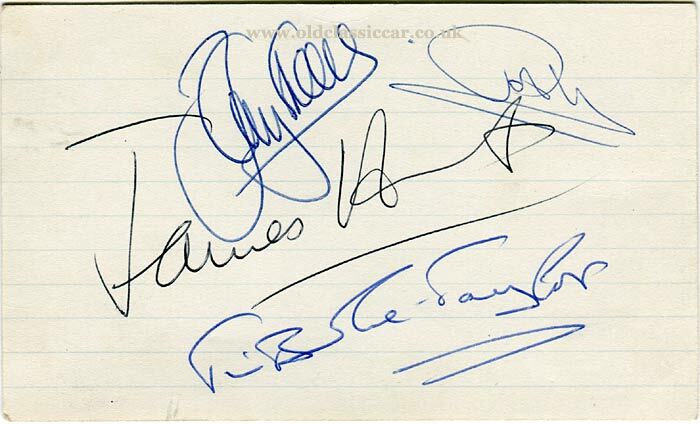 This page: Motorsport-related autographs, of car and motorcycle racers. Collecting autographs of anyone, whether it be a film or music star, or in this case motor racing personalities, isn't for everyone. Many can't see the point, especially if the current owner of said items didn't actually acquire them in person. To others it's not really an issue, especially when the subject is no longer with us to sign them in person. While I've accumulated a number of autographs myself, I wouldn't call myself a collector as such, and rarely go out actively looking for them. Some just turn up, while others were acquired as a memento of the day they were collected. The biggest issue surrounding the buying and selling of autographs is establishing their authenticity. There are plenty of faked signatures in circulation, so care needs to be taken if buying from an unknown source. The best option is to ask for and receive an autograph in person, but this can't always be achieved. Genuine autographs can still turn up in the most unlikely of places, as the following descriptions of autographs I've found will demonstrate. A few years ago I bought a small collection of motorcycle-related bits and pieces from an online auction. There were speedway programmes from the 1960s, various leaflets relating to motorcycles of the 1960s and, amongst them, the following item of ephemera. 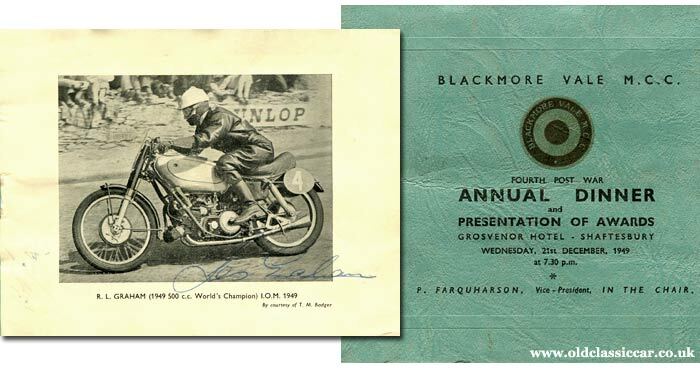 It's a small handout for an awards dinner organised by the Blackmore Vale Motorcycle Club, held at the Grosvenor Hotel in Shaftesbury, in December 1949. The first page has a photograph of motorcycle racer Les Graham, at speed on the Isle of Man T.T. in 1949 - the year he won the 500cc World Championship. The seller hadn't noticed the autograph, so omitted it from their description. There is a second, badly faded, signature for Bob Foster, also a T.T. winner. Les Graham was father to racing driver Stuart Graham, who as it happens lives just a short distance from OCC HQ. James Hunt, Barry Sheene & Pat Hennen. While walking around a car boot sale in 2015, a table with various film and radio star signatures upon it looked promising. Most were pre-prints, or of people I'd never heard of. An unassuming sheet of paper had a number of motor racing-related names written in biro upon it, with the uppercase words "Oulton Park April 1977", our local circuit. Turning it over, revealed a matching set of what I think are genuine autographs. The top two are for Barry Sheene, famed for his exploits racing motorcycles, and another for Pat Hennen, the American racer on two wheels. In the centre, written in black unlike the others which are in blue, is what looks like a genuine autograph for James Hunt, the 1976 Formula 1 World Champion. The final signature is for Tim Brooke-Taylor, famous in the 1970s for being part of The Goodies on TV. Are these genuine though? My hunch is that they probably are. If someone was out to sell fakes, they'd have put them on separate pieces of paper rather than all together. The strange mix of three racing personalities and a single TV star together on a single sheet, is an odd combination too, which again suggests that they were acquired at an event where various personalities were in attendance, and approached when the opportunity arose. Although not a guarantee of anything, research for matching autographs tends to support this theory. Plus, if someone was out to con a buyer, they'd have asked a reasonable sum for them, not the pocket-money price the small piece of paper came for. 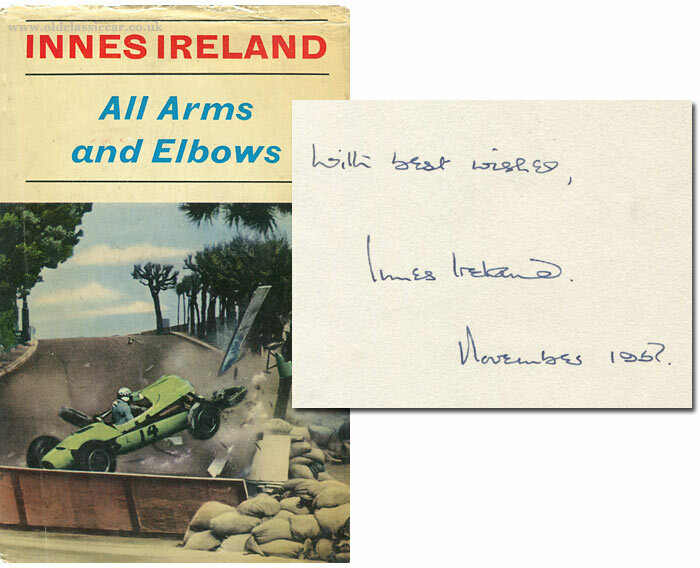 Grand Prix winner Innes Ireland's autobiography "All Arms and Elbows" was published by Pelham Books, in 1967. This copy turned up in a secondhand bookshop quite a few years ago. The shop owner must have spotted the handwritten message on the front page, as he wrote the asking price on the top corner of the same page. Despite this, the price was not particularly high. As far as I can tell, it's a genuine message penned by Ireland himself. I only discovered in recent years, that when Ireland lived in mid-Wales, he was good friends with one of my great uncles, who recalled having a number of exciting passenger rides around Welsh roads in Ireland's Jaguar saloon. Moss, Hill, Surtees & more. 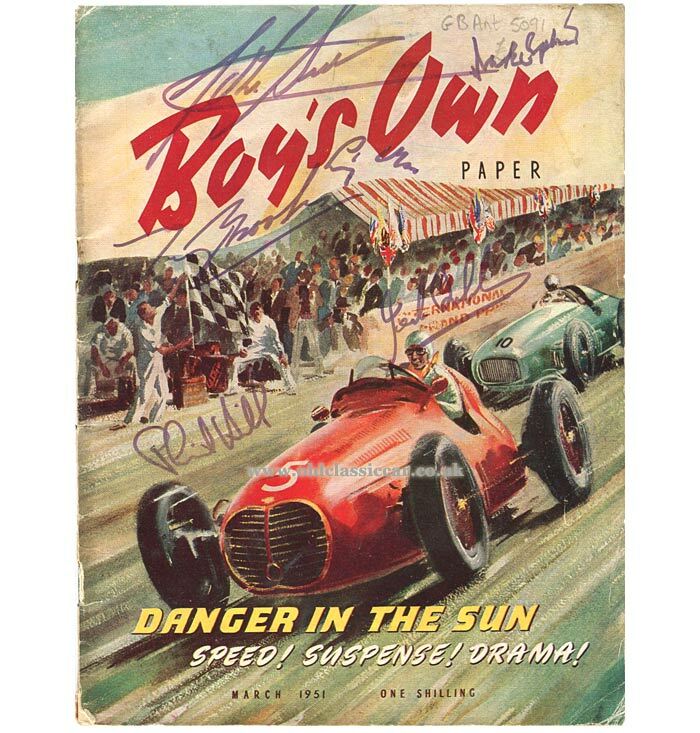 The following copy of Boy's Own magazine (1951), has a number of genuine autographs on its cover. I know that they're the real deal as I collected these myself at Goodwood, in 1999/2000. To the top left is that for John Surtees, alongside the signature of Duke Naylon, an American driver who started out racing Midgets and later sprint cars in the 1930s. He was also a regular entrant in the Indy 500, his final race taking place in 1953. Below are those for Tony Brooks and Stirling Moss, while in the centre are those for Phil Hill and Jack Brabham. One of the best-known British drivers of the 1930s - 1950s era was Raymond Mays. Pre-war he was a key member of the team that formed ERA, or English Racing Automobiles, cars in which he - and many other drivers - achieved a great deal of success in, at sprint, hillclimb, and circuit meetings alike. 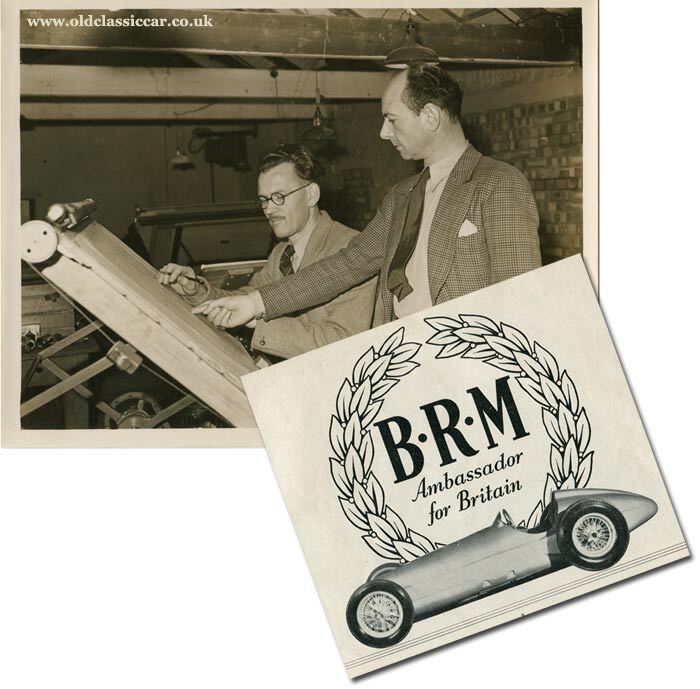 After the war, British Racing Motors (BRM) was formed, headed as was ERA by Mays. The initial plan was to built an all-conquering British Grand Prix car, the BRM V16, designed to take on and beat the competition presented by the likes of Maserati, Alfa Romeo, and Mercedes-Benz. The extremely complicated design of the car led to it never fulfilling its initial promise. The following letter turned up at auction a few years ago, and was won for a nominal sum. 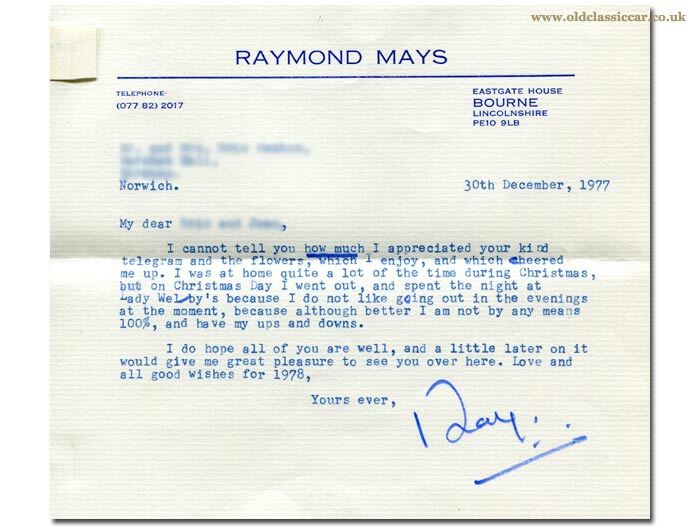 It's typewritten, on "RAYMOND MAYS" headed paper, and is signed simply "Ray". The envelope also bears the franking of Mays' local sorting office in Bourne, Lincolnshire. A second note is stapled to the letter, reminding the recipient that he was due to feature on 9th February 1977, in a BBC2 TV series "World of Difference", in an episode that looked at racing drivers. Again, I've no reason to doubt that this letter is anything but correct. As an aside, a photograph of Mays and Eric Richter stood in the BRM drawing office in Bourne was bought on a different occasion, and is shown below. In 1950, the Daily Express produced a comprehensive booklet describing the development of the BRM V16. One copy I have, has a handwritten note at the top corner of an internal page, which appears to read "Raymond August 1950 Londres". It may be handwritten by Mays, although it doesn't match other examples of his handwriting that I've seen online, so is probably by someone else. Quite why "London" is written in the French (or Spanish, Portuguese etc) translation, I'm not sure about either. Perhaps someone reading this can shed light on who might have written this? 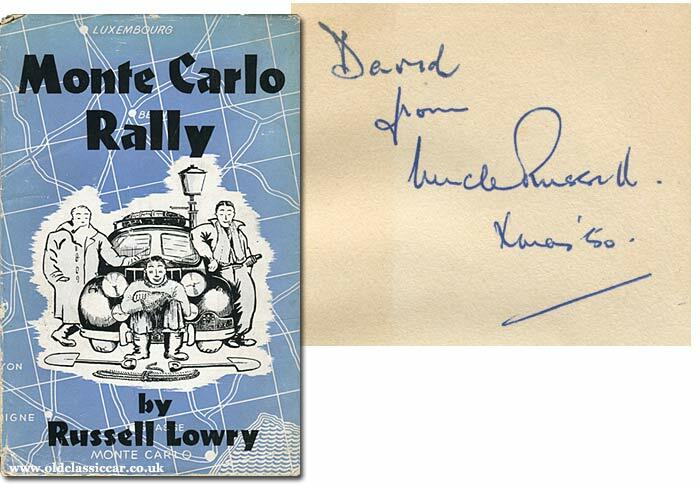 Russell Lowry published a book in 1950, regarding his exploits on that year's Monte Carlo rally. This copy has an inscription, rather than a full autograph, on the opening page, dedicating the book to "David", from his "Uncle Russell", Xmas 1950. Is Uncle Russell, actually the author himself? A search on Google Images brings up an autographed copy of the same book, and the style of writing is a match for that shown below, so is likely to be the author's own hand. More examples of what I think are real autographs, will be added to this page soon. While I'm not actively looking to add to my collection, if I found autographs for other well-known drivers of the 1930s-1960s era, I could be tempted. Return to the car collectables section, or read about other racing-related items here.